If nothing else, the year 2013 has been a great one for gamebooks. With Tin Man Games continuing their excellent work with original and licensed works that faithfully recreate the feeling of a real book, Forge Reply and Bulkypix bringing back an old favorite character with stunning new presentation in Lone Wolf (Free), and inkle’s great interpretation of the epic Sorcery! ($4.99) saga, I dare say fans of the genre have never had such a wealth of interesting, quality choices as they do today on mobile platforms. We reviewed the first part of Sorcery! earlier this year and came away quite impressed with inkle’s spin on the concept, and I’m happy to tell you that it only gets better in Sorcery! 2 ($4.99). In the last month, I’ve reviewed three different gamebooks from three different developers, and I think it’s remarkable that for games that are from a genre that you’d expect to have rigid rules, all three of them have approached the concept in pleasantly different ways. Gun Dogs ($1.99) aimed to put a perfect digital representation of a gamebook in your hands, Lone Wolf went for a very interesting mix of the old and the new, while Sorcery! 2‘s gamebook origins are almost unrecognizable at first glance. Those of you who played the first chapter will know what I’m talking about, because mechanically nothing is different from last time. You may want to re-join me a few paragraphs down, because I’m going to go over things you probably already know. It’s funny because of the three, only Sorcery! 2 was an actual physical book at one point. Originally published in the early 1980s as Sorcery: Khare – Cityport of Traps, this installment is most people’s favorite of the four books. Following in the footsteps of the first book, this book had a few unique twists when compared to the non-Sorcery Fighting Fantasy books. Most notable was the introduction of magic, which actually required a separate illustrated book that listed all the spells. For the most part, though, gameplay was very familiar. Turn to this page for this choice, turn to that page for that choice, roll some dice to see if you survive the fights. The iOS Sorcery! games have no page numbers and dice are only used for gambling. They instead opt to use the story and choices in a new framework. 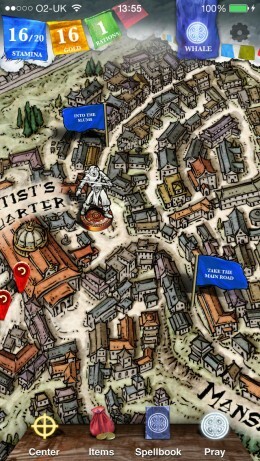 The text still shows up looking rather like scraps from a book, and you’re presented with the same choices along the way as you would have in the old gamebook, but instead of clicking on a choice, you instead go to an overhead map and drag your little pewter-looking piece to a point on the map. When you want to use a spell, the game goes to a different interface where the letters are floating around for you to choose. The biggest change is in the battle system, though. Instead of rolling dice against stats, you simply decide each turn how much power you want to invest in your attack. This is done by dragging your character closer to or farther from the enemy at the bottom of the screen. Particular ranges of power correlate with attacks like thrusts and sideswipes, with zero power representing a defensive posture that also restores some of your power gauge. Whoever uses more power damages the other and avoids damage themselves. If a character adopts a defensive stance, only a single point of damage will be done to them, regardless of the power of the attack. 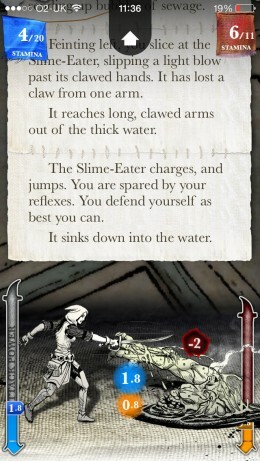 In each round of combat, the game will give you a bit of text that can give you a hint as to how much power you should be using. Each enemy you’ll encounter has a few different tells that signal their next move. I really enjoy this combat system. I’ve got nothing against dice, but this battle system feels more deeply connected with the reading experience. I often zone out reading the battle text in gamebooks because I just want to roll my dice and get on with the story, but in Sorcery!, I’m reading every word carefully, looking for a good opening. It’s a very simple system at its heart, but it works well enough and is an incredibly good match for the genre. Of course, this all goes for the first chapter of Sorcery! as well. In that game, you set out to recover the Crown of Kings on behalf of your liege, traversing the Shamutanti Hills on your quest to reach the fortress of the Archmage. That chapter took you as far as the outskirts of Khare, a city of thieves that sits on the edge of the wastelands. The Hills were filled with many villages and interesting characters, as well as an assortment of dangerous foes to fight. There were a lot of different paths to success and each path would leave you with different items and relationships with other characters. Well, courtesy of either a password or the cloud, you can carry that over into this chapter, which takes place almost entirely in the city of Khare. Going from a countryside packed with villages, forests, and caves to just a single city might make this chapter sound like it’s shorter or more limited, but the truth is quite far from that. Khare is a massive city, and you’ll really need to explore it well to find what you need in order to move on. There are a bunch of new enemies to encounter as well, and if you thought the manticore in the last chapter was tough, wait until you see what’s in store for you here. Overall, there are fewer locations in this chapter compared to the first, but more to do in each one, and it’s great fun untangling the riddle of how to move on to your next destination. If you didn’t play the first chapter, you can start here with a very basic set of equipment and supplies. It’s enough to get you through the game. I highly advise carrying a character over from the first, though. Part of what makes Sorcery! such a special series of gamebooks is the excellent continuity that builds through your choices along the way. Plus, there are lots of spells and items you’ll only have access to if you played the first chapter. This second chapter of the series is a very exciting story from start to finish, with tighter pacing than the other books. It’s considerably larger than the first chapter with many more choices, but it manages to stay interesting all the way through. There’s even a new mini-game in the form of Swindlestones, a fun little bluffing game played with four-sided dice. There are lots of different states you can leave the city of Khare in, depending on how your adventure proceeds, and that goes for both your character and the location. I’m not sure about anyone else, but I loved going through every little nook and cranny of the first Sorcery! to find every secret, and that same feeling hit me just as hard here. Facilitating that search for secrets is the handy ability to rewind to any point in the story at your leisure. Simply hit the marker on the map and confirm, and you’ll be sent back, allowing you to take the road less traveled. This feature can be used to game the system quite a bit, should you choose to, and as a result, Sorcery! 2, like the first chapter, is a bit kinder and gentler than most other gamebooks. Still, there’s so much to do and see, it’s hard to complain about the lack of difficulty. The journey is more than long enough to give the player a good value. Since this is part two of four, Sorcery! 2 ends a little abruptly, like the first chapter. There’s still a huge part of the adventure ahead of us, and no matter how you end this chapter, it truly feels that way. There’s still a very satisfying mini-arc going on here, certainly better than the one found in the first chapter, but when you reach the end, you’re going to be chomping at the bit for the next part, which isn’t due until April 2014. If you had a good time with Sorcery!, I probably don’t even need to tell you to buy this. You jammed the buy button as soon as it appeared on the App Store. If you missed out on it, I’m going to do something strange and tell you to check out the first chapter before you look into this one. After you’re done with that one, you can come back to this review and follow the advice at the beginning of this paragraph. Sorcery! 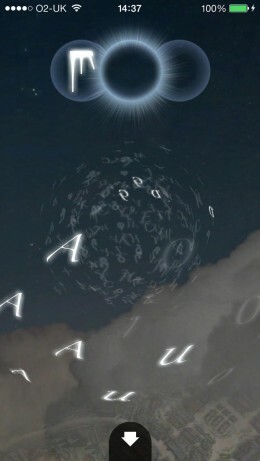 2 is my favorite chapter of a huge, awesome tale, and inkle’s take on it is wonderful for genre fans and novices alike.